Biopolymer Coatings Market size exceeded USD 750 million in 2015 and gains are expected to be over 6%. Increasing application scope in general packaging, food & beverage packaging, pharmaceutical, automotive and textile industry owing to being environmental friendly products should drive biopolymer coatings market size. Favorable government support and initiatives to promote cost efficient and renewable energy resources should fuel product demand. Biopolymers coatings can be derived from polysaccharides, lipids and proteins. These products can be used alone or together. Pigments, antioxidants, antimicrobial agents and antioxidants are used and added to final solutions to improve the properties. Asia Pacific paper production accounted for over 45% of the overall demand in 2015. Rising environmental issues of degradation and landfill along with shift in consumer focus from plastic to paper and cardboard usage should drive packaging industry. Growth in paper packaging demand owing to food & beverage industry expansion should propel biopolymer coatings market size. Global flexible packaging market size was over USD 150 billion in 2015 and may surpass USD 250 billion by 2024. Positive indicators for using renewable based products in food & beverages industry should drive biopolymer coatings demand for flexible packing application. Increasing consumer preference towards lightweight products and to improve packaged materials quality may enhance industry growth. Global bioplastic production capacity was over 3.5 million tons in 2015 and may exceed 7 million tons by 2024. These renewable based products can restrict unwanted moisture transfer in food products, have good oil and oxygen barrier properties, biodegradable, and can replace current synthetic paperboard and paper materials. Polylactic acid (PLA), starch, cellulose, soy protein and chitosan are key raw materials used for manufacturing process. PLA is widely used in food & beverage packaging applications and is used by limited manufacturing firms due to its high cost and low thermal stability which may challenge industry growth. Fluctuating raw material costs may hinder industry profitability and affect biopolymer coatings market price trend. Protein based biopolymer coatings are mainly based on corn zein and soy. Soy protein coatings market should expect gains close to 4%. Corn zein protein coatings are mainly used in pharmaceutical and food & beverage applications. PLA coatings market should witness highest gains at over 13%. These products are widely used in general and food & beverages packaging industry on account of its biodegradability, odour barriers for foodstuff, and resistance to oil-based products. PLA based biopolymer coatings market size from food & beverage packaging application should surpass USD 50 million by 2024. Food & beverage applications includes fruits, vegetables, alcohol, water, and nuts packaging. The packaging material has good barrier properties and extends product shelf. Bio PU coatings market size should witness gains at over 6%. It is widely used in architectural, automotive, textile and furniture industry. It can replace petrochemical based products due to their lower environmental impact, easy availability low cost and biodegradability. Bio polyamide coatings market size may witness significant gains over the forecast timeframe. It is used in various automotive, wire good, electrical, construction, and general industries due to electrical insulation, chemical resistance, and fire resistance properties. Europe biopolymer coatings market size should witness significant gains at over 6%. Favorable regulatory support pertaining to fortification of naturally derived ingredients in food & beverage industry should drive regional growth. Germany biopolymer coatings market size should witness an increase in demand owing to presence of strong automotive manufacturing base. These products can be used for automotive applications which include dashboards, steering wheels, car seats, door seats and consoles. China biopolymer coatings market size may witness significant gains at over 6.5%. Rapid industrialization along with government initiatives in renewable packaging solution should stimulate regional industry growth. Strong indicators for growth in construction spending towards floorings, furniture, and deckings should promote product demand. Brazil biopolymer coatings market should witness gains at over 5.5% by 2024. Increasing consumer preference towards biodegradable products should drive industry growth. 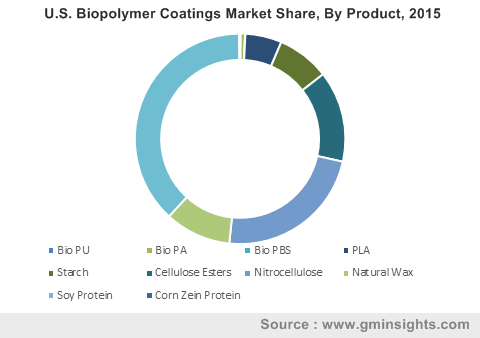 Global biopolymer coatings market share is fragmented. Companies are focusing on product differentiation based on price and quality. Companies are also focusing on business expansion along with setting up new plant for increasing production capacity and regional presence. Companies are also investing in research to develop products for textile and food & beverages applications. Some of the companies operating in this market include Cargill, Roquette Group, AkzoNobel, BASF, Novamont, Corbion, and EcoSynthetix which cater to regional and domestic markets. Biopolymer coatings are used as protective shields for packaging materials on account of low oxygen, high flexibility, rigid mechanical strength and water vapor permeability properties. Strong application outlook in floorings, automotive, decking, and furniture should drive bio PU market growth demand. PLA is a biodegradable polymer obtained from various agricultural products including sugarcane and corn. Increasing consumer awareness towards green packaging, recyclability, and sustainability should drive industry growth. Starch is commercially extracted from various plant sources including, potato, corn, wheat, rice and tapioca. It is used as a coating agent due to its excellent film forming characteristics. Cellulose esters is used as binders, additives, modifiers in primers, paints, enamels, and lacquers.